Jerome Sader, Kate Brunk, and Katie Spoden participating in one of the conference’s mobile learning tours in Detroit. In July, three Stevenson Center Fellows attended the annual Community Development Society (CDS) conference in Detroit. The conference brings together academics and practitioners for three days of sessions, discussions, and workshops that integrate research and application. 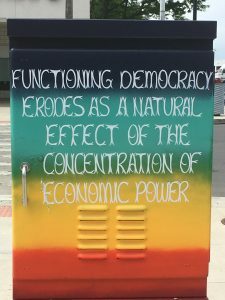 A painted electrical box in Detroit’s Eastern Market, a hub for local food businesses. Eastern Market is home to one of the oldest and largest year-round markets in the United States. Support from the Hunt Family Fund and the Alice Ebel Monthly Scholarship enabled Kate Brunk, Jerome Sader, and Katie Spoden to participate in the conference and network with other community developers. Additionally, Spoden was selected to present her research on farmers markets as tools for community development. The Hunt Family Fund supports educational activities relating to civil society, social entrepreneurship, institution building, and community development. Bob Hunt is emeritus faculty in the Politics and Government Department and founder of the university’s Peace Corps Fellows Program. Alice Ebel, the first chair of the department and the first woman elected to the McLean County Board, established a scholarship for women pursuing careers in public service. All three students are AmeriCorps alums and in the second year of the Applied Community and Economic Development Fellows Program through the Stevenson Center. Because they started their year-long professional practice over the summer, the CDS conference offered a valuable opportunity to reflect on their past year of academic coursework and to prepare for work with their various host organizations. Brunk, a graduate student in the Politics and Government Department, is serving with the East Central Illinois Area Agency on Aging (ECIAAA) in Bloomington. She is planning and implementing interventions to reduce social isolation across the agency’s sixteen-county service area. 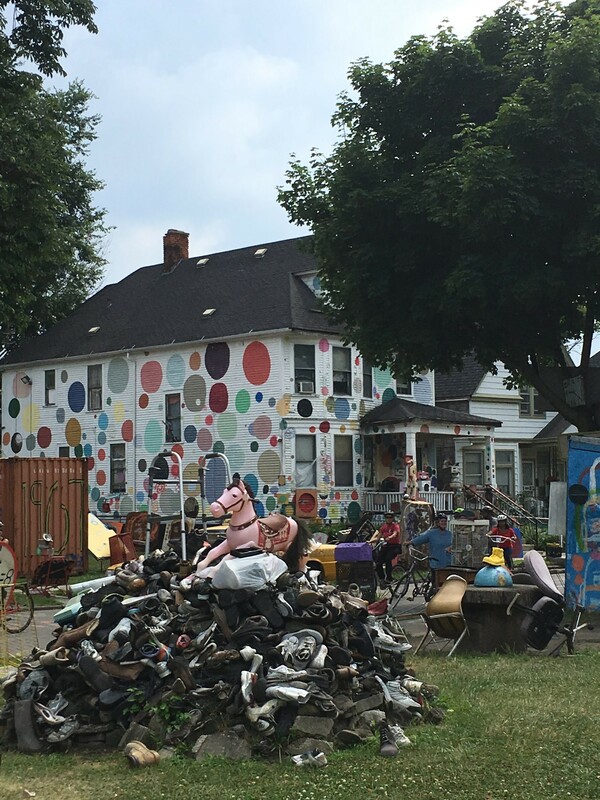 A scene from The Heidelberg Project. The project is run by a Detroit-based community organization with the mission to improve the lives of people and neighborhoods through art. Sader, a graduate student in the Economics Department, is with the policy advocacy team at Housing Action Illinois. Sader is supporting the organization’s efforts in lobbying, voter registration outreach, and coalition building. 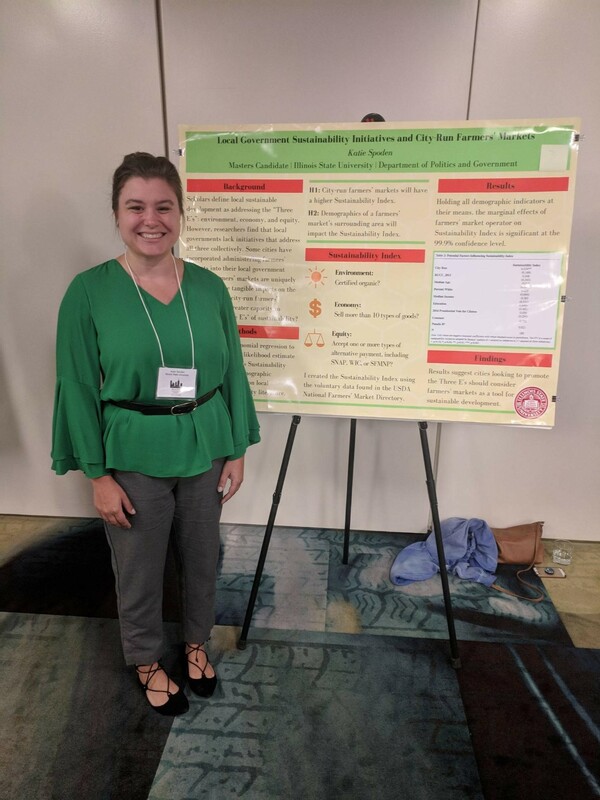 Katie Spoden presented research at the Community Development Society conference. Spoden was selected to present her research at a poster session during the CDS conference. “Having the opportunity to share what I have done in the classroom with academics and practitioners provided a great opportunity to receive feedback and hear other perspectives,” said Spoden. Her research focuses on farmers markets and their impact on sustainable community development. “My favorite part of the conference was the location. Detroit is at the forefront of innovation using agriculture to promote well-being and equity. With my interest in food and agriculture as a tool for community development, this was especially meaningful.” Spoden, a graduate student in the Politics and Government Department, just started her placement with the Alliance to End Homelessness of Suburban Cook County. 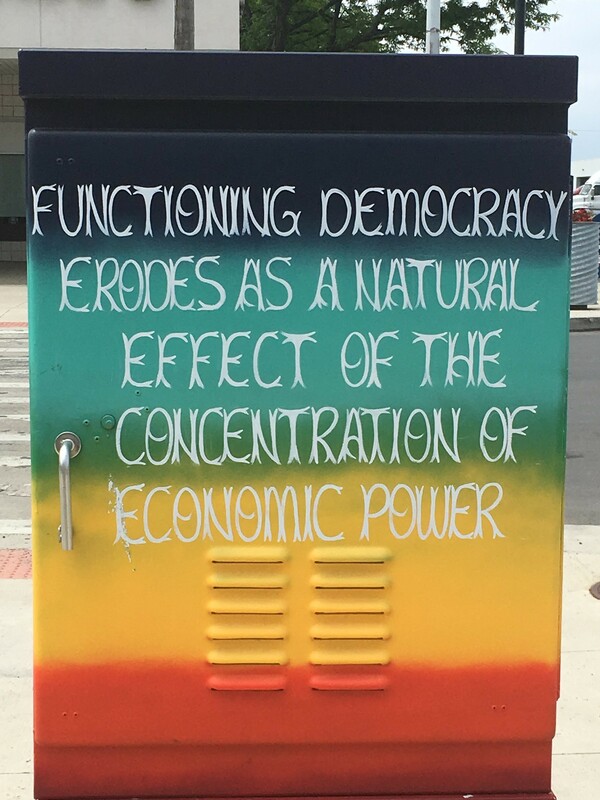 With Detroit as the background, the CDS conference provided an opportunity to reflect on the city’s renaissance. Researchers, practitioners, and local organizers shared their diverse experiences overcoming barriers to create their visions of community. The CDS conference enabled the students to build on the interdisciplinary discussions that the Stevenson Center fosters during the first year of coursework.